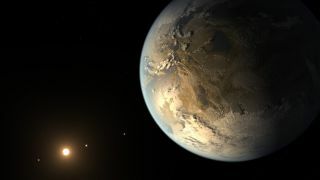 Kepler-186f, the first Earth-size planet orbiting in the habitable zone of its star, is just one of the many potentially habitable planets in the Milky Way galaxy. More than 1,000 astronomers and space fans are bringing their interstellar smarts to Boston, Massachusetts for a conference this week. The 224th meeting of the American Astronomical Society is set to run from Sunday (June 1) to Thursday (June 5), and it is expected to be jam-packed with talks ranging from the hunt for alien worlds to the mysteries of dark energy and dark matter. Space.com will be coverage the event live from Boston all week. "Even without the AAS in town, the Greater Boston area occupies a key spot on the astronomical map thanks to its being home to the Harvard-Smithsonian Center for Astrophysics, the Massachusetts Institute of Technology, Boston University, Boston College, Tufts University, the University of Massachusetts, the Chandra X-ray Center, Sky & Telescope magazine, the American Association of Variable Star Observers, and several other institutions with cosmic connections," AAS press officer Rick Fienberg wrote in a statement. "With so many astronomers already in the neighborhood, the Boston meeting promises to be a particularly dynamic gathering." Anyone in the Boston area can also participate in the conference. Members of the public can attend the AAS sessions for $50 on Tuesday (June 3). Representatives with the organization have also set up two short talks geared toward amateur audiences that day. One talk is about habitable alien worlds and the other is focused on supernova forensics. People in the area can also come out to a free star party on the Boston Common on Tuesday (June 3) from 7 p.m. EDT (2300 GMT) to 11 p.m. EDT (0300 June 4 GMT). Weather permitting, amateur astronomers and professionals will set up telescopes trained on the moon, Mars, Saturn and other cosmic sights for members of the public to examine, according to the AAS.